Last Saturday saw my final show as presenter of Erewash and Beyond. I wanted to take this opportunity to update this sadly neglected blog one last time. I want to say thank you to Laura-Kate Smith for being the producer, for in-studio (but sadly off-mic) renditions of various songs and for being an all round good mate. Thanks also need to go to Paul Stacey and Ian Perry for looking after the show in my absence. It’s been a good run and extremely enjoyable. We featured great new writing from people in, around and beyond the borough, including one former and one current Derbyshire poet laureate. We teamed up with the Derbyshire literature festival to bring you the winners of a nonsense writing competition. We’ve had strange news from our twin towns and other places around the world. There was frozen sauerkraut delaying Germans on the autobahn, illicit watermelons in Tashkent and a poo-powered brewery in Kiev. News, history, the odd bit of cookery, increasingly bizarre celebrity gossip and Hawaiian backing music, are just some of the things I’ll miss presenting to you every Saturday. In the phrasing of so many disgraced politicians, I’m leaving to spend more time with my family. Mrs Walker and I are expecting our first child in a few weeks and I won’t be able to offer the commitment that Erewash and Beyond deserves. However, this isn’t goodbye so much as “I’m nipping to the shops, doesn’t anyone want anything?” I’ve got a new podcast in the pipeline and, if time allows, I hope to remain involved with Erewash Sound. You never know what 2013 will bring. Meetings, for the most part, are dull. They go on too long, often dominated by one person making the same point over and over. And often their only saving grace is that it gives you time to decide what to have for tea and whether you need to get anything from the shops. If you decide that you need some butter or honey, perhaps, you can start to make a list while your colleague drones on. This has the added benefit of looking like you’re engaged in the meeting and not biding time till the end of any other business. If it’s a late meeting childcare issues can be a great excuse to slip out early. If you haven’t got any kids, why not invent some? “I’m terribly sorry but I’ve got to pick up Agamemnon [or whatever name you’d like for your amazing fictional child] from ice hockey practice [or Scouts, or drama group, or junior shooting club, whatever].” Yes, poor Agamemnon, I mustn’t leave the little blighter alone, exposed and prey to the dangers of modernity you interminable, meeting monsters. That said there are some meetings that I would have enjoyed being at. This includes the meeting during the Second World War where our chaps were deciding how best to fox Jerry so that the ruddy Hun didn’t rumble radar. The RAF had made great advances in radar but didn’t want the Nazis to know that that was how they managed to shoot down enemy bombers and that an airborne version had been developed. Letting this secret out would make radar stations more of a target and lead to work on counter-developments for airborne radar. I can’t be certain but I’d love to imagine a wood-panelled room filled with Britain’s best minds, sipping tea and nibbling on cake to get the old grey matter going. Now then chaps, one might proffer, how do we stop the Germans from twigging about radar? I’m sure many suggestions would have been offered, from claiming that we’d trained bats to report back with intel to claiming that we’d mastered the spirit realm and were getting guidance from famed Victorian cook Mrs Beeton floating through the air and giving away enemy locations. “Give them one for me lads!” What really happened though was perhaps just as daft. The RAF claimed that their personnel were able to pinpoint and destroy enemy targets due to their enhanced ability to see at night and that this was all thanks to carrots. This suggestion that the carotene in carrots boosted night vision also encouraged the British public to eat more of the orangey vegetable. One information poster declared ‘carrots keep you healthy and help you see in the blackout’. 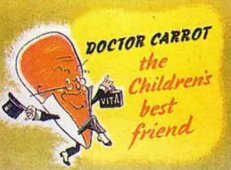 Food was scarce during the war but there was a glut of carrots and other vegetables, to keep the nation fed the Ministry of Food promoted veg through songs and posters featuring such characters as Dr Carrot and Potato Pete. They also wanted to promote growing your own to save on national resources. In 1941 Lord Woolton, Minister of Food, declared: ‘This is a food war. Every extra row of vegetables in allotments saves shipping… the battle on the kitchen front cannot be won without help from the kitchen garden.’ Woolton’s statement made it clear that everyone had their duty to perform whether soldier or civilian. Dr Carrot encouraged kids to consider carrots as an alternative to sweets and a healthy one too. He always carried around a bag of Vitamin A to show that carrots were chock-full of this vital vitamin. Carrots were used to sweeten desserts because sugar was in such short supply. You could even get carrot treacle. And if you fancied a glass of pop, how about some carrolade? It was a yummy drink made from carrot and swede juice. Carrot jam, carrot tart, even carrot curry were all consumed to tuck in to the surplus of carrots and keep the home front healthy. With so many fresh vegetables in their diet and a limit on sugar and fats the British emerged from the war healthier than ever and skilled at putting together meals that were filling, frugal and full of essential nutrients. After all a carrot is full of vitamins A, B and C. You’ll also find potassium, folic acid, magnesium and much more. They’re great raw but if you want to add to their natural sweetness why not serve these homefront heroes honeyroasted this Sunday lunchtime? Boil some chopped carrots for about five minutes. Meanwhile melt some butter and honey in an oven proof dish, and when ready chuck in your chopped carrots and leave to roast in a hot oven for about 20 minutes. So in short, chop, boil, melt, chuck, roast. Eat. Yum. Just what Dr Carrot ordered. Art Spiegelman’s Maus is one of the most lauded comic book works in history and even won a Pulitzer Prize in a specially created category. The first volume of this graphic tale of Holocaust survival was first published in 1986 and was one of what comics critic Roger Sabin terms ‘the big 3’ along with Frank Miller’s Batman: The Dark Knight Returns (1986) and Alan Moore and Dave Gibbons’ Watchmen (1987). The big 3 broke through from the comic shops to the mainstream media and encouraged many of headlines declare comics that had grown up. This was regardless of the fact that Spiegelman’s Maus emerged from a decades old comics counter culture that tackled everyday life and politics with brutal honesty and often biting satire. The first thing you’ll notice about Maus is that the characters are all drawn as animals. Jews are portrayed as mice, chased after, captured, tortured and murdered by Germans in the guise of cats. It depicts the experiences of Spiegelman’s father through the Second World War, from fighting in the Polish army against the invading Germans, to his attempts, along with his family, to evade Nazi capture, and eventually his incarceration in Auschwitz. It goes beyond memoir or biography by showing Spiegelman’s efforts to retrieve material from Vladek, his father, and also his own psychological burdens as a child of survivors. Spiegelman’s well researched, historical document presented a new way of reading the Holocaust. Through Maus he strives to give history a human dimension, at times in conflict with his father’s wishes. After Vladek recounts details of how he met Artie’s mother he insists that they should not be included in the book: ‘It has nothing to do with Hitler, with the Holocaust!’ Artie disagrees, recognising that: ‘It makes everything more real – more human.’ Vladek declares that to add such detail would be improper and not ‘respectful’. He makes Artie promise not to include it. The inclusion of this sequence reinforces Vladek’s human dimension. Maus is far from a sentimentalised version of the Holocaust, the animal imagery offers a surface cuteness that wraps a tale of cruelty and events so traumatic that they pass from one generation to the next. Spiegelman refuses to portray his father as the perfect, pious survivor and, although he is drawn as a mouse, we are offered a fleshed-out human being, vain, short tempered, and obsessively frugal. He is also quick-witted, intelligent and loving, in spite of the strained relationships he has with his son and his daughter-in-law. Vladek Spiegelman emerges from the crowd of Holocaust victims from behind the wire. His voice is picked from the millions who suffered and the minority that survived, to speak out, not for everyone, but for himself to show that Nazis’ program of extermination affected individuals, people with families, lives, and dreams beyond the archive footage that we have inherited from the cameras of the liberators. While promoting Maus in Germany Spiegelman was asked whether he thought it was in bad taste to have done a comic book about the holocaust. Spiegelman replied ‘No, I think the Holocaust was in bad taste’. Spiegelman has created a work of art and terrifying wonder. We are drawn to peer into the wound of Europe’s shameful past and become witnesses to the horror, its memory refreshed so that we can say once more ‘never again’ and hopefully mean it this time. Further reading: Spiegelman’s In the Shadow of No Towers shows the aftermath of the World Trade Center Attacks in 2001. Joe Sacco’s comics journalism about Israel/Palestine, such as Palestine and Footnotes in Gaza and also his books on the former Yugoslavia including Safe Area Gorazde and War’s End. She was intelligent, witty, ambitious, fabulously wealthy and feared and admired by the men who ruled the lands around her. Lover of Julius Caesar and then Mark Anthony she bore children for both and at times looked ready to rule the known world as a divine Empress. However, her vision was cut down by the man who would become the first Roman Emperor. Cleopatra was born in 68BC into the Ptolemaic dynasty that had ruled Egypt from Alexandria since the death of Alexander the Great in 323 BC. The Ptolemies were a lively bunch of Macedonians who took to the Egyptian royal tradition of brother-sister marriage. When they weren’t getting hitched to their siblings they were plotting against relatives and having each other killed. Ptolemy XII, was known to his subjects as a drunken flute player and when this inebriated musician died he left Egypt to his 18 year old daughter Cleopatra to rule jointly with her 10 year old brother Ptolemy XIII. The usual family squabbles, egged on by eunuchs and other court officials, drove Cleopatra from Alexandria. Young Ptolemy’s guardians held the government while Cleopatra raised an army to prepare for her return. Meanwhile in Rome things were kicking off with civil war between supporters of conqueror of Gaul and many a senator’s wife’s bedchamber Julius Caesar and the celebrated general Pompey the Great, owner of the finest quiff in antiquity. Pompey’s forces were eventually defeated and Pompey sought refuge at Alexandria. After all he’d helped Ptolemy XII keep his throne. Surely his kids would repay the favour? Nope. Ptolemy’s advisers decided to murder Pompey and get on Caesar’s good side. It backfired and Caesar wept upon being presented the great general’s head on a platter. With Caesar in Alexandria Cleopatra had to find a way to get to him, past her brother’s forces and palace fortifications. Legend and lascivious fantasy have Cleopatra hidden in a carpet and then unrolled at Caesar’s feet to reveal the queen in all manner of titillating attire. More sober accounts have her fully clothed in a plain tunic and then bundled into a hemp or leather sack and smuggled past the guards that way. There’s no time to muse on Caesar’s motivation at this point but after an evening with Cleopatra the new ruler of Rome decided to sort out Egypt’s mess. Not everyone was happy with Caesar’s decisions and more fighting broke out. Caesar and Cleopatra’s forces prevailed. Ptolemy XIII drowned and Cleopatra’s similarly ambitious sister was captured. Instead of annexing Egypt at this point he put Cleopatra on the throne but made sure to stick to tradition and had her marry her other brother Ptolemy XIV. Cleopatra and Caesar went cruising down the Nile for a month before the general returned to Roman business. With Caesar gone the queen put her house in order and Ptolemy XIV mysteriously perished leaving Cleopatra as sole ruler of Egypt. She then gave birth to Caesar’s son and went to Rome with the one-year-old boy to see her sister paraded in chains. Her visit coincided with the dreaded Ides of March and she fled Rome after Caesar’s assassination. The two main players in Rome were now Mark Anthony and Octavia, Caesar’s designated heir. Anthony summoned Cleopatra to Tarsus where she appeared with a full fleet and in spectacular costume. Many days of feasting followed and the two hit it off, eventually giving Cleopatra more half-Roman children. Their relationship increased rivalry with Octavian who saw Cleopatra’s son as competition for title of Caesar’s heir. The boy had been declared king of Egypt by Cleopatra and was seen as a threat to the seat of power in Rome but the world seemed to hold no limits for the ambitious queen. Soon the forces of Anthony and Cleopatra were going up against those of Octavian. The gains they had made were lost and the pair retreated to Alexandria. Octavian and his army caught up with them. Anthony fell on his sword but missed his heart and slowly died in Cleopatra’s arms. Octavian arrived and had Cleopatra arrested. She had no desire to be paraded through the street like her sister as part of Octavian’s triumph and so she made the ultimate escape. Popular myth has her bitten by an asp or a cobra. It’s more likely that she took poison herself rather than rely on an animal. She was however dressed in magnificent garb and exited the world with the dignity of an ancient queen. In death she asserted the independence that so troubled the men holding power around her. Cleopatra achieved greatness in a brutal world dominated by men and has enjoyed a bumpy reputation. Even those had to admit that the last queen of Egypt was quite extraordinary. For one of the more bizarre news stories of the week we must turn to Hesse in Germany, where Long Eaton’s twin town of Langen is located. I’ve had some brilliant times in Germany and can’t wait to go back again, mainly so I can thank them for this gift of a story, so perfectly German in its Germanic Germanness. Yes, in a story that could only come from Germany a spillage of sauerkraut caused traffic chaos on the A5, or Autobahn Funf as the Germans call it, during rush hour this Tuesday morning. The pickled vegetables were spilled after an accident involving two lorries and a car and froze on the road. The autobahn had to be closed while workers used salt to work off the frozen veg causing tailbacks of 10 kilometres (just over 6 miles). One woman was injured and the whole episode was said to have caused about 100,000 euros worth of damages. How much of that 100,000 was taken up by lost sauerkraut isn’t mentioned. Nor is there any word on a sauerkraut appeal to help those people in Long Eaton’s twin who may be missing out on pickled veg. For news on Erewash’s twin towns tune into Erewash and Beyond every Saturday from 1pm only on Erewash Sound. We’re liveon 96.8fm locally and streamed on www.erewashsound.com. Ladies and gentlemen this week’s key ingredient is the avocado. This single seeded berry is a versatile food. You can stick it in a salad, mash it into guacamole, and slice it in sandwiches with chicken and bacon. You can even have it on crumpets according to one of my friends, although I’m not too convinced about that one after all this came from the same person who told me to put banana on pizza. In the Philippines you’ll find it pureed with milk and sugar to make an avocado shake and in Indonesia you may be served it mixed with milk, coffee and rum to make ‘es apokat’. Avocados are also popular ingredients in beauty products such as facials, creams and massage butter. The avocado has the skin of a Harryhausen dinosaur, it could be the egg of a lizard alien from science fiction or the minds of certain conspiracy theorists. The reptile-like outer probably led to its alternative name of the alligator pear and gives it the appearance of something ancient and mysterious. But where do they come from? Well, trees. Tall ones that grow in groves in hot places such as Mexico, Hawaii and Florida. It’s been knocking around in the human diet for millennia, much like last week’s star the potato, and like the spud was first munched on in the Americas. Archaeologists unearthed a pre-Incan pot in the shape of an avocado dated to around 900 BC. The Aztecs loved them, probably almost as much as they loved a spot of ritual human sacrifice to ensure the rising of the sun – which is one of those old traditions that seems to have been neglected of late. One of the main reasons the Aztecs enjoyed avocados was because of their reputed aphrodisiac qualities. This reputation for giving one a helping hand with the ahem you know was commented upon by King Charles II’s physician W Hughes who tried it for the first in Jamaica, avocado that is, in 1672. “It is one of the most rare and pleasant fruits of the island. It nourisheth and strengtheneth the body, corroborating the spirits and procuring lust exceedingly.” I bet it does, you dirty seventeenth century so-and-so. The avocado was also known as midshipman’s butter, named for low ranking naval crew, and spread on sailor’s biscuits during long sea voyages. In fact this use of avocado is also prevalent in Mexico where it is sometimes known as poor man’s butter. There was a time in Britain though when the avocado was an exclusive food enjoyed by the wealthy. In the early 1900s the fruit became a mainstay of aristocratic dinner parties but it wasn’t until 1962 that they first appeared on the shelves on British supermarkets, another exotic food emerging from the shadow of rationing. They really became popular in the 70s, something that probably helped link it to naffness and dodgy evenings with the neighbours. It has also suffered from the misconception that it is unhealthy due to its admittedly high fat content. This fat is monounsaturated, one of those good fats that seem to get trumpeted as helping against heart disease. They’re high in fibre, will leave you feeling fuller for longer and contain other such goodies as carotenoids, which are linked to protection against eye disease. They have a folate content which has been said to help in pregnancy and also to help keep your heart healthy. The avocado is also high in protein, making it the most protein-rich fruit you’ll find. And they contain almost double the amount of potassium as bananas. One of my favourite ways to eat avocados is to make guacamole, mainly to stick in fajitas but also to enjoy with some tortilla chips. You’ll need a ripe avocado for this, so maybe stick one with your bananas for a couple of days or do some careful squeezing in the supermarket to find one whose flesh yields slightly under the skin. Take your avocado and cut carefully lengthways all around the fruit, using the stone to steady your knife. Twist and halve the fruit then remove the stone. Scoop out the light green flesh and put it in a bowl. Add in some finely chopped red onion, about half a small one for this recipe. Then a small, de-seeded and finely chopped tomato, a mild de-seeded and chopped chilli, a pinch of salt, some chopped coriander leaf, and the juice of half a lime. Mash that all together with a fork, adding more water or limejuice as necessary. Serve straight away but if you do need to keep it fresh for a bit cover it in cling and place in the fridge. That old chestnut about the avocado stone preventing discolouration is nothing but a myth. All that Aztec stuff about avocados’ special properties perhaps needs more research. So, slice, scoop, mix and mash and there you have guacamole perfect for a King’s physician or suspect 70s dinner party. Every Saturday during ‘Key Ingredients’ on Erewash and Beyond we look at a different food and its place in our lives. This week’s key ingredient is the potato, a staple of human diets for millennia. They’ve grown wild in South America for as long as 13,000 years. People in Chile have cultivated potatoes since at least 5000BC and the crop has taken well to European soils providing the bulk of many British meals – bangers and mash, fish and chips and the good old roast all cry out for the terrific tuber that is the spud. It’s said that the Vikings were the first Europeans to set foot in the Americas, early in the 11th century. History’s a little sketchy on what exactly Leif Erickson and friends got up to while they were over there. However scientists have hypothesised that, based on genetic sequencing undertaken in Iceland, the nautical Norsemen returned with at least one Amerindian woman. What we really don’t know at the moment is what American foods the Vikings sampled on their trip. They may have encountered the potato but I don’t think the Icelandic sagas make specific reference to recipes for hash browns or shepherd’s pie. Sir Walter Raleigh is the one who usually gets the credit for introducing both the potato and tobacco to Europe but as is so often the case this is more myth than fact. The Spaniards beat Raleigh and his crew to the spud’n’smokes chase by bringing them back to Europe in 1570 meaning that our Elizabethan ancestors already knew about them. What Raleigh did do though was popularise smoking at court. So we’ve got him to thank for that. The potato wasn’t an immediate hit across the British Isles. Some Protestants refused to plant the new crop because there was no mention of potatoes in the Bible. Catholics on the other hand were much more open and liberal in their attitude, and would at least consider munching on spuds as long the seed potatoes had been sprinkled with holy water and planted on Good Friday. The fact that potatoes are not the prettiest of produce and originated amongst the heathens of South America did much to delay their acceptance. For a couple of centuries many tried to encourage the consumption of potatoes but it took the food shortages of the late 18th century to make it become a staple of English diets. The scarcity of other food was accompanied by pamphlets and editorials extolling the virtues of the potato. The upper classes, inspired by pro-potato literature, took to the tuber first and were followed soon after by the lower classes, finding that hunger and fashion were antidotes to superstition and suspicion. In nineteenth century England and Wales, a boom in population accompanied the boom in potato cultivation and consumption and it is debatable which was the cause and which was the effect. Potatoes are extremely nutritious containing vitamin C as well as protein, potassium, B vitamins and starch. This helped fight against the effects of such diseases as scurvy, dysentery, tuberculosis and measles. The industrial revolution needed fuel for its workers and the potato was there to provide it. And in the 1860s while British innovation was enjoying a high the good old fish and chip shop was born giving hot, reasonably inexpensive and filling comfort food to the masses. Chippies soon spread across the land, wrapping fast food in old newspaper and keeping Britain going. Some have argued that it was the government’s protection of supplies for fish and chips that saw the nation through the first world war and George Orwell suggested the comfort food as the balm that stopped the working classes from revolting. This national dish of ours was seen as so important that during the Second World War the government made sure that it was one of the few foods not to be rationed. The popularity of fish and chips has waned over the years with the number of chippies reducing from around 35,000 in 1929 to around 10,000 in 2009. Part of this reduction may be due to the broadening of our palate thanks to the more cosmopolitan build of our society and the increase in our travel abroad. It may also be due to health concerns about eating fried food. And as a responsible public broadcaster I would urge you to enjoy chips in moderation and as part of a healthy lifestyle. That said I am now going to talk you through making perfect chips at home. Yes you can get them from a freezer bag, bung them in the oven for 20 minutes and bingo you’ve got chips, you could walk down the road and get some from the chip shop, you could also microwave them inside some nasty cardboard but I think there’s great enjoyment to be had out of making simple things from scratch and doing it well. For my perfect chips I triple cook them. Peel your spuds, cut them into chip-size chunks, wash them in cold water and then blanch them in boiling water for about three minutes. While those are blanching get a pan of sunflower oil heated up. Drain and pat dry your blanched chips then chuck them in the oil. Let them fry until they begin to soften and then remove them from the oil, soaking up the excess with some kitchen towel. Now leave them to cool. You could do the blanch and first fry hours ahead of when you actually need the chips, leaving you time to get other things ready. Once you’re ready to do the final fry get some oil heated up again and then throw in your chips. When they’ve become golden and crispy on the outside they’re ready to eat. This may sound a lot of faff for chips but you will be presented with a delicious, crispy outer with a hot fluffy middle. Serve with whatever you like but I’ll have mine with some battered fish, a generous serving of mushy peas and a couple of slices of bread and butter on the side. Potato perfection on a plate.